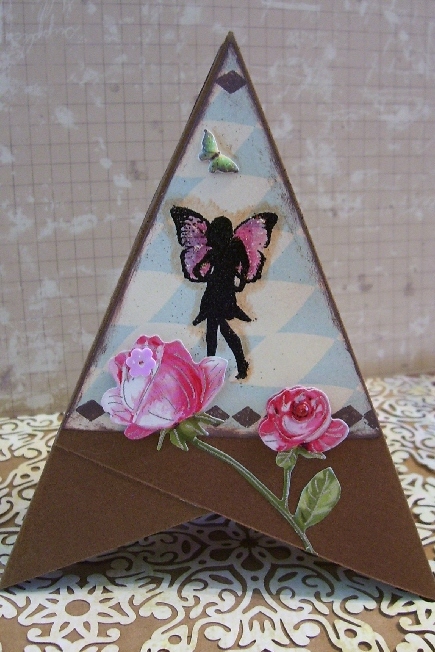 Recently over at Bella Creations Voila Ink group, we were challenged to make a Tee Pee card with the theme of fairies. 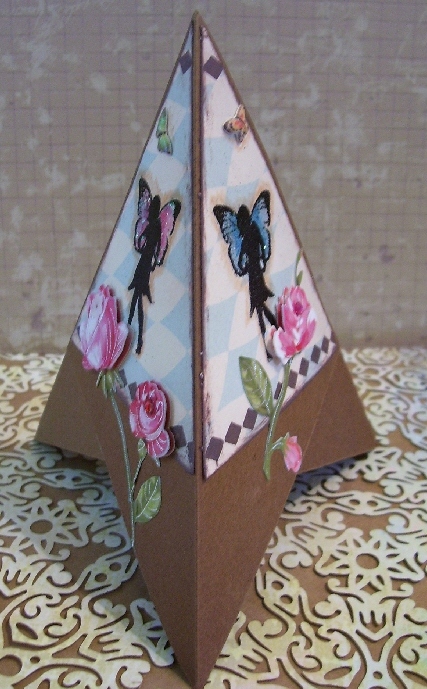 So, since at the time it was posted I still wasn't on Wireless and could not watch the posted video for the making of a tee pee card, I had looked up an alternative blog to see how it was made and want to share that link with you here. This is the card I made and just want to share my creation with you. It is a fun alternative to the flat version. These are fun and very easy to make. I hope you tackle one as I did below. They do fold flat and you can fit them into an envy to mail. I think they would make a nice little center piece for a party as well or special occasion. We had Canada on Friday and it was spent at home very quietly til evening rolled around and my dearest hunbun husband just had to scare the cat with his cherry bombs,but, after all, you can't take the kid out of him. Rosie was encourage to return from her hiding place basement and a good time was had by JB. Saturday we went for a nice evening ride on the Harley and had coffee in a nearby town and returned home before dark. A good time was had but us. Today was humid and we just stayed home to watch the continuation of the trial of Casey Anthony on HLN TV. Thanks for dropping by and hope you had a nice long weekend in Canada and I wish my American friends a great 4th of July weekend as well. Your card looks fab Lesley! Love your Teepee card, such a great idea!! I love that card and will check into that tutorial.